Winter running always sees lots of people running for the treadmill, or dreadmill as many call it, to avoid the cold dark nights and at some points of the year, snow and ice. Personally this is my favourite time of year and running in snow can be a great workout. Ice however is more of an issue and in some cases a significant hazard. 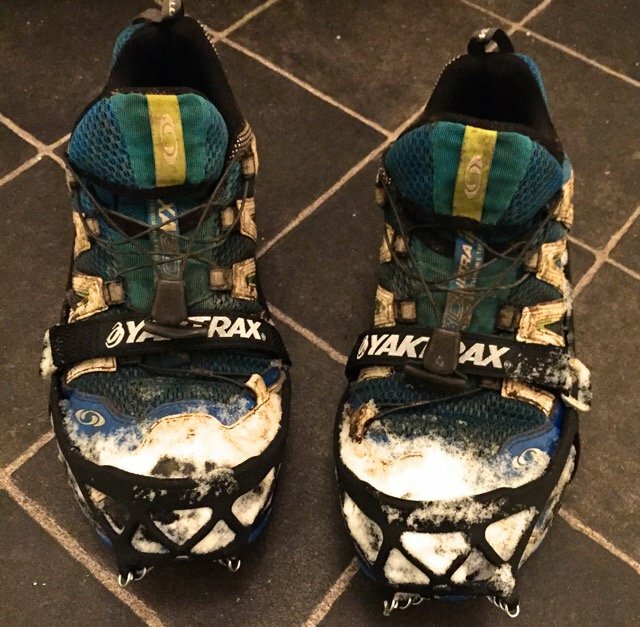 A couple of years ago after turning my ankle on some frozen mud, I was determined to find a solution and stumbled upon Yaktrax. The concept is simple. Yaktrax are a series of connected rubber bands that are wrapped in metal coils and pulled onto the soles of your shoes or boots. Once securely attached, a 20 second job, the metal coils give you great grip, or at least that is what they claim. The video above gives a good demo. Last year was warmer than normal in the UK, so I never got the opportunity to test them out. In recent weeks a cold snap has hit the UK and when I packed for a work trip to the Highlands last week, it seemed a great oppportunity to throw the Yaktraks in the bag. I’d gone for the Pro version, which is recommended for runners and adds an additional strap, to go across the shoe for added stability. Fitting was extremely straight forward, with you stretching the rubber around the shoe and securing the strap. Within a minute I had the Yaktrax attached to both trail shoes and was ready to run. We were running on packed snow and ice and I have to say they worked like an absolute dream! I was able to run with my normal turnover and style and when we did hit some clear trail or tarmac I was able to continue as before with no impact on grip or stability. Going uphill or down, I was able to run hard or easy with no slipping or sliding at all. 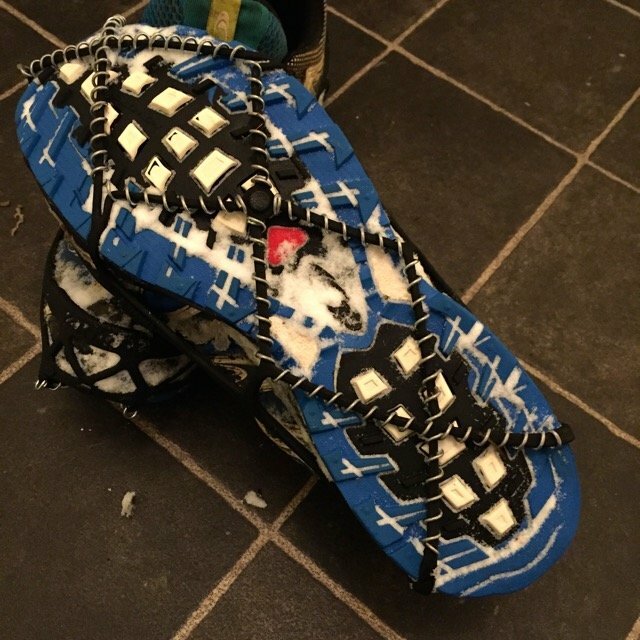 I never tested them on large expanses of sheet or black ice but for the conditions I was running in, which are typical of UK winter after a heavy snow fall, they were a massive success. Removal was as easy as putting them on and they fold down so they are quite compact and could easily be stowed in a small bag or race vest. There are other options on the market, however if you are looking for a lightweight option which you can wear across a wide range of surfaces while keeping you stable, I can highly recommend the Yaktrax Pro.